Cross Ranch State Park is located along some of the last free-flowing and undeveloped stretches of the Missouri River. While exploring Cross Ranch State Park, visitors may find themselves traveling back in time, catching a glimpse of the landscape as it appeared to Native Americans inhabiting the area hundreds of years ago, or hearing the echoes of the Lewis and Clark Expedition making its way to the Pacific coast along the Missouri River. Cross Ranch has over 13 miles of trails that cater to the adventurer all year long. This extensive trail system can be explored either on foot or cross-country skis during the winter months. The trail system allows access to a 5,000-acre nature preserve with mixed prairie grass, river bottom forests, woody draws and roaming bison. 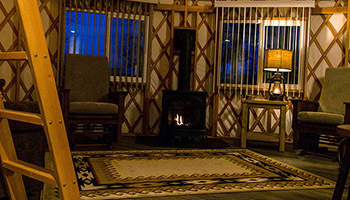 Cabins, yurts and a tipi are all available for overnight lodging along with two different campgrounds. A boat ramp is available for those wishing to explore this scenic segment of the river. Anglers will find walleye, trout, catfish, salmon, pike, and bass in its waters. 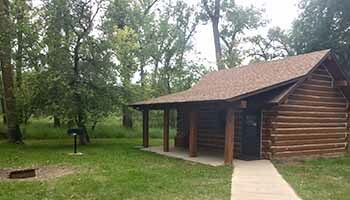 Nestled between the historic cottonwoods of Cross Ranch State Park, is the newly constructed full-service York Cabin. This cozy home away from home is the perfect year-round getaway. The cabin sleeps six with a bedroom, queen bed in the loft and a pullout couch. This cabin offers breath-taking views of the Missouri River and access to miles of beautiful trails. On the weekends (Friday & Saturday) and holidays, a two-night minimum stay is required for the York Cabin. Find seclusion while tucked away at the Art Link Log Cabin. 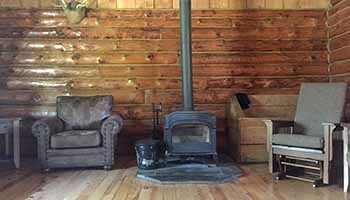 This spacious cabin is available for year-round meetings and overnight rentals. 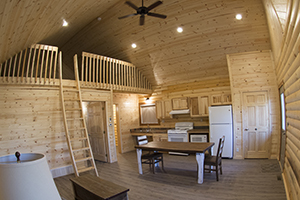 The cabin includes one bedroom with two sets of bunk beds, pull out couch and a loft space that accommodates up to six (loft does not include beds). The cabin is near vault toilets and water. Shower facilities are available year-round at the Visitor Center. This cabin sits among the old growth cottonwood forest and includes two bedrooms with electric heat, loft space (loft does not include beds), overhead lights, and a woodburning parlor stove. The cabin can sleep up to five and is located near vault toilets and water. Shower facilities are available year-round at the Visitor Center. - Full-service cabins check-in is after 4 pm, check-out is at noon. 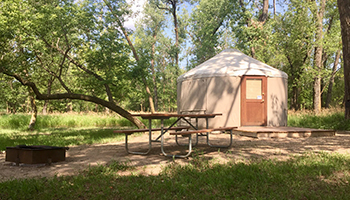 - Game or fish cleaning in or around cabins, yurts or tipis is not allowed, please contact park staff for other arrangements. 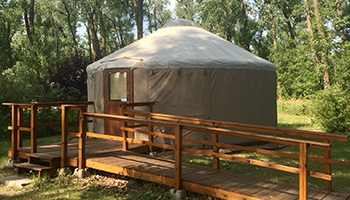 - Pets are not allowed in cabins, yurts or tipis. included in rental fee. Four canoes are currently available for rent. Cross-country ski rentals are available for $15/day. The park has 24 pairs of skis available for rent. Adult boot sizes only, please call the park for specific information on sizing and availability. included in rental fee. The park has 2 single and 2 double kayaks available for rent. Snowshoe rentals are available for $15/day. The park has 12 pairs of snowshoes available for rent. Children and adult sizes available. 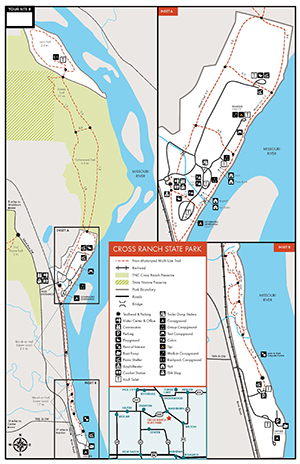 Cross Ranch provides two different run options down the Missouri River. A 9-mile trip from the city of Washburn to the Sanger boat landing or a 2-mile trip from the main campground to the Sanger boat ramp. The amount of time the runs take depends on how fast the user paddles and the speed of the river. The park charges a transportation fee of $30 with an additional $15 if another vehicle is required for transportation. Please call the park at (701) 794-3731 to make arrangements. 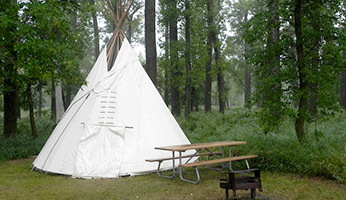 Situated along the west bank of the Missouri River, the 589-acre Cross Ranch State Park and adjacent 6,000-acre Cross Ranch Nature Preserve are one of the few areas in North Dakota to offer a true primitive outdoor experience. Over 16 miles of trail wind through Cross Ranch State Park and Nature Preserve. Trail posts identify the trail names. This trail begins at the Visitor Center and loops around the park's main use areas. Along the river, interpretive signs describe the history, wildlife and geology of the area. The Matah Trail Self Guided Loop is the innermost loop covering 1.4 miles and takes up to an hour and a half to hike. Self-guided brochures are available at the trailhead or Visitor Center. This trail is divided into two sections. The 2.5 mile Upper Ma-ak-oti Trail starts from the Matah/Ma-ak-oti trail junction and continues to a creek flowing through a wooded ravine. The 1.7-mile Lower Ma-ak-oti Trail begins at the Sanger trailhead and continues north, joining with the upper trail. Looping in parts, both sections of the trail wind through prairie bluffs and wooded channels, offering vistas of the Missouri River. Steep stairs without handrails are present on portions of the trail. Some areas may be muddy or impassable due to seasonal water fluctuations. This trail is open to hiking and snowshoeing. It is not groomed for skiing. These connected trails (Cottonwood 3.3 miles, Gaines 2.1 miles) are accessed from the Matah Trail at the preserve boundary. They wind through the bottomland forest on preserve property and follow an old jeep track still used for scientific studies. Hikers are asked not to disturb areas marked with paint or flags as studies are still in progress. Groomed for skiing. A 2.2 mile route that winds through the Lewis and Clark backcountry on a 300-acre accreted "island" that joined the mainland following the completion of Garrison Dam. Groomed for skiing. This trail crosses over two miles of preserve prairie and wooded draws. A guidebook at the trailhead provides information on wildlife, plants and history. The trail is part of the Nature Conservancy bison pasture. The trailhead is located three-quarters of a mile north of the park entrance. Not open for skiing. Please note that Bison are present on this trail, remember to keep a safe distance and respect that they are wild animals. Bluegrass Goes Pink is an event that raises awareness of cancer. All proceeds that are collected from this event are donated to the Bismarck Cancer Center. The day starts with a 5K & 10K run/walk trail race at 9:00 am. Cottonwood then plays relaxing bluegrass music during the evening to commemorate cancer survivors and those who have fought bravely. Welcome to our 4th Annual Bison Stampede Run! On Sunday, August 11, we invite you to stampede with us on a variety of back-country runs that are located alongside the Missouri River in an old-growth Cottonwood forest. This year we are hosting a 5K, 10K and 15K run in our beautiful park! Registration will include race and breakfast access in addition to a memorable Bison Stampede item. A small breakfast will be served post-race to include fruit and granola bars. We will also serve refreshments such as coffee, water, and juice. In conjunction with our surrounding communities, we wanted to offer free blueberry and raspberry scones for Small Business Saturday. Since it is our Visitor Appreciation Day, all daily entrance fees to Cross Ranch State Park are waived. Feel free to shop small within our surrounding communities and take a relaxing hike through the park while replenishing with scones and chai tea or coffee. We hope to see you there!